The folks at 2 Hour Wargames are getting into the crowd funding game with a company I haven't heard of called Indiegogo which seems to be similar to Kickstarter. I haven't bought All Things Zombie yet but I have been planning on getting it and it looks like now is the time. 2 Hour Wargames are offering up a lot in this crowd funding campaign. First off is a new supplement for All Things Zombie called High Rise To Hell and it looks pretty promising. Here is what they have to say about it : There has to be a Cure or so you’ve heard. It starts with the Prosperity Corporation but if it’s true it will be tough to get. There’s a High Rise in the center of the city, the home office of Pro Crop and that’s the best place to look. It’s abandoned now, so is much of the city, but with a little luck maybe you can find the Cure. Maybe not, but if the rumors were true you may find other things in there that can help you. It’s worth a try, so what are you waiting for? The next thing being offered are miniatures in 15mm. 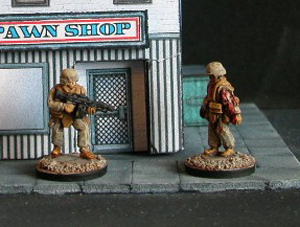 These miniatures are sculpted by Rod Campbell of Highlander Studios. 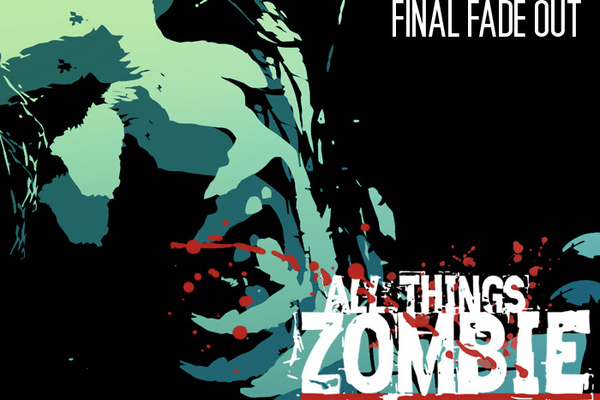 There will be a miniature produced for each type of character in the ATZ rulebook as well as a zombie counterpart for each human. 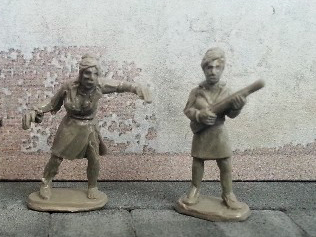 Now I do own a few minis in 15mm, mostly WW2, but I game in 28mm especially when playing skirmish games. Now the minis themselves look pretty good and I'm sure if you game in 15mm they would be a great choice but normally I would pass. For those of you who play in another scale like me and are interested in the rules and cards you can pledge the $40 dollar option which cuts out the minis. The thing is I haven't made up my mind if I'm going to buy these minis yet and it's because of the next thing being offered. In my eyes the most interesting thing being offered is a completely new way to play All Things Zombie and 2 Hour Wargames games in general. 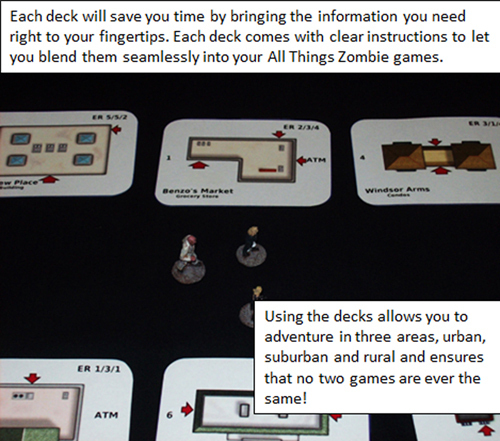 There are two playing card sized decks called the City Deck and the Zombie Deck. 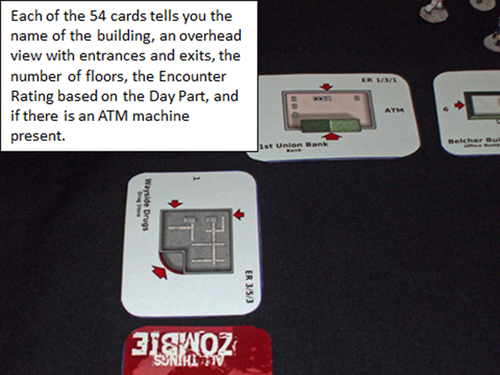 The city deck consists of 54 cards of terrain locations for gaming All Things Zombie. Each card has all the information needed for the game so you do not have to flip back and forth through the rulebook. There are cards for the three types of terrain urban, suburban and rural. With these cards you can play a game without the need of physical terrain. The Zombie Deck is the deck you use when you need to determine what kind of zombies your characters have encountered in their travels. Each card contains all the information for the amount of zombies encountered for each of the three different types of terrain as well as any things you may find if you defeat the zombies. 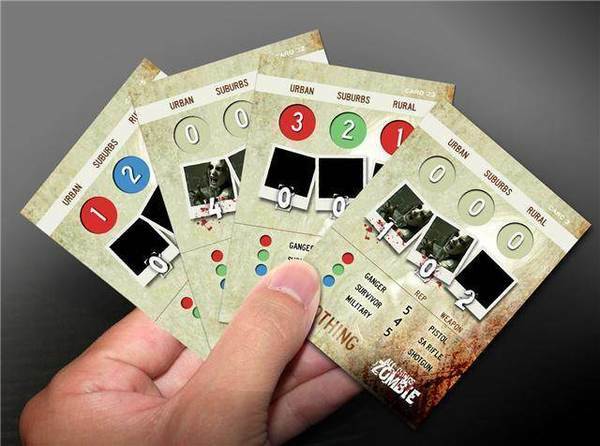 The Zombie Deck alone sounds like a great way to play, when you encounter a zombie instead of flipping through the rules to determine what you're up against you just pull the top card off the deck with all the information at your fingertips. 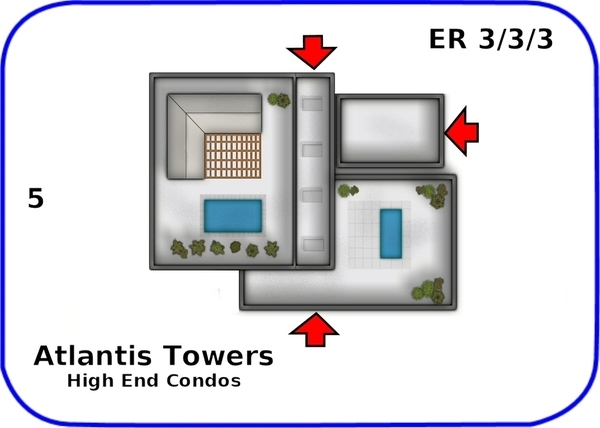 The City Deck could be used with physical terrain, layout your terrain and each building gets its own card with all the information ready to go. The other way to use the deck opens up new way to play the game. 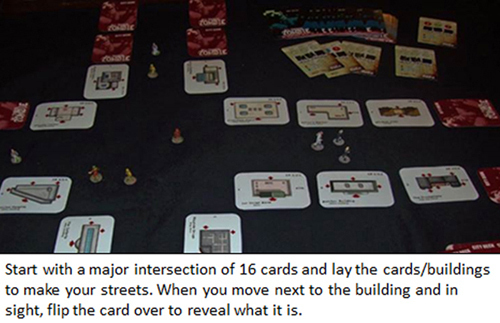 Say you want to play a quick game of ATZ or maybe you're going to a friend's house and don't want to lug all your terrain with you, now you can play without any physical terrain and just use the City Deck. To play ATZ all you would need is the two new decks, the rulebook, some minis or tokens to represent your characters and dice and your ready to play. You can now play a complete game of ATZ and keep everything you need to play in your pockets. And here is my dilemma, like I said I don't play 15mm but I'm seriously thinking about buying some of these so I will have some small miniatures that I can easily take with me and combine with the two decks to be able to play on the go any time I want. Even though I haven't played All Things Zombie it runs on the same Chain Reaction system that After The Horsemen, NUTS! and Six Gun Sound run on but with zombies instead of cowboys or Nazi's so I know I will like ATZ. I'm very excited about this new way to play a 2 Hour Waragmes game so I hope you will give it a try. The Indiegogo campaign has a little over a month to go and has raised $3400 out of the $5000 needed so it's looking good! So if you have never played a 2 Hour Wargames game and are interested in giving the rule system a try, or a zombie fan, or maybe you just want some great looking 15mm human and zombie miniatures now is your chance to help out a great company and get a great rule set! !